The previous home of the Film Forum was operating from 1980 until 1989 when closed and was demolished. The theatre’s current home is at 209 W. Houston Street. I believe this theatre closed in ‘89 and there was a hiatus of about a year before the new Film Forum opened on Houston Street. 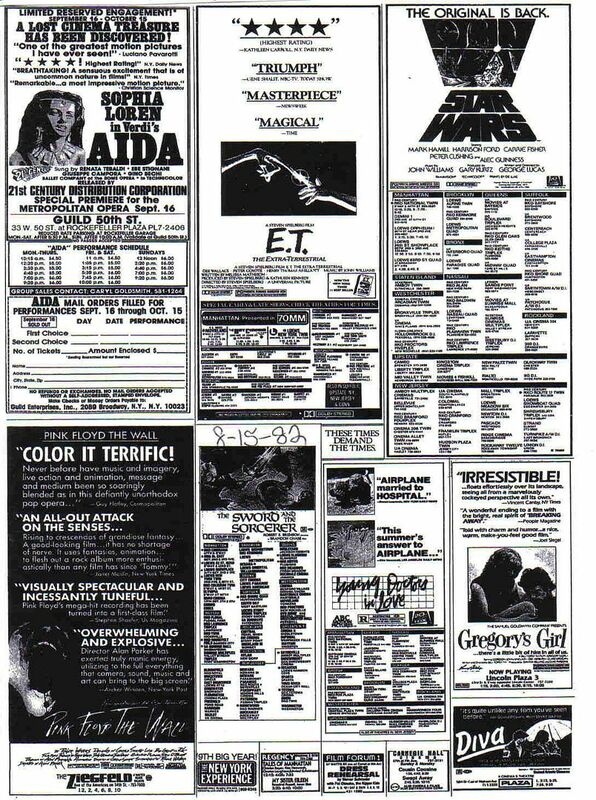 I don’t remember going to the Film Forum all that often in eighties, though I wasn’t as into film back then. I remember the first time I went there I caught RED RIVER for the very first time. I also remember for some reason they revived ALIEN. I remember going to a late screening on a Sunday night and it was raining out. It was not a well attended screening and I had the **** scared out of me. I also remember seeing a terrific indie film here called BLESS THEIR LITTLE HEARTS, which I caught again recently at BAM. It held up very well. And I can remember one night trying to get into CHINATOWN and it sold out. Does anyone remember what the booking policy of the FF was like in the eighties here? I wonder why I didn’t go more often? Was it similar to the new Film Forum, which does have an additional screen. There is a small ad here for Film Forum in 1982. If I remember correctly the two cinemas in the original Film Forum were positioned side by side. They were small but comfortable and didn’t have that tunnel effect that you get in that one auditorium at the present site. I saw the original run of Gus Van Sant’s MALA NOCHE there and the restored print of THE BOYFRIEND. That pic is the Fourm 47th/Movieland in Times Square. I went to this incarnation only once in ‘82 to see a British animation called “The Plague Dogs. I hadn’t moved to the city yet and was unfamiliar with the area but it was quiet and desolate. When I saw Scorcese’s 'After Hours” a two years later, I could relate. The Film Forum was initially located in a loft space on West 88th Street, followed by moves to 80 Wooster Street (which also housed Anthology Film Archives, prior to their move to the Second Avenue Courthouse building; I’m pretty sure 80 Wooster has since been converted to residential space) and 15 Vandam Street, which currently houses the Soho Playhouse (and formerly the Thalia Soho and Le Cinematheque). The programming at 57 Watts Street was one screen of limited-run premieres and one screen of revivals; without the third screen, few of the premiere engagements moved to other theatres in town when their runs at the Film Forum ended. Here is the image I posted on the Houston page by mistake. This appears to have operated from 1980 to 1989. The 88th street location was open from 1970 to 1980.